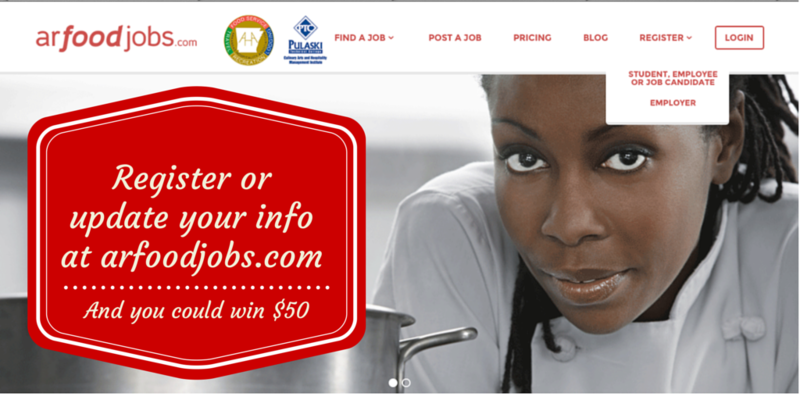 We’re happy to announce a few behind-the-scenes updates to our website here at arfoodjobs.com. While it doesn’t look much different on the front end, there are lots of new, exciting things going on. Read on, and we’ll tell you how this might put a $50 Visa gift card in your hands. The first thing you might notice is that registration is now divided into two categories: Students, Employees and Job Candidates; and Employers. We broadened the scope of our first category to include students and employees who might not be looking for a job right this minute, but they want to participate in our community. We can’t say we blame them. Candidates can now let us know which culinary or hospitality programs they’ve been a part of, so we can connect them with alumni and those wishing to hire from a particular program. Candidates can also create a dynamic online resume and more easily apply to jobs with just one click. You can also let us know if you’re actively looking for work or just here for the networking and education, which is just peachy with us. We also have a few new goodies for employers. You will now be able to browse candidate resumes the instant you post a job opening, so your search for the perfect candidate can start right away. (Resumes are not visible to employers unless they have an active job listing.) Also, employers are now able to track candidates through our system, helping you keep up with who you have contacted, when you have scheduled an interview, and confidential notes on each candidate. So, how does this get $50 into your hands? Easy. If you are a current registered user of arfoodjobs.com, just click here (Edit Account) to update your information. And that’s it. On Election Day, Tuesday, Nov. 4, 5 p.m., we’ll choose two registered users who have updated their information to receive a $50 Visa gift card each. We will contact the winners directly and announce them on social media. Help us spread the word and get as many people fully registered as possible. Our community of culinary and hospitality professionals is growing, allowing us to help each other even more.